Do you suffer from acne? Let’s face it ladies, nothing is more annoying. I have tried a variety of different products over the years and I have found that while some do work, they often leave my skin dry and feeling not so great. In a way, using acne products brings its own problems, which can be fixed…by using products that encourage acne. Sometimes it feels like a no-win situation for all of us. 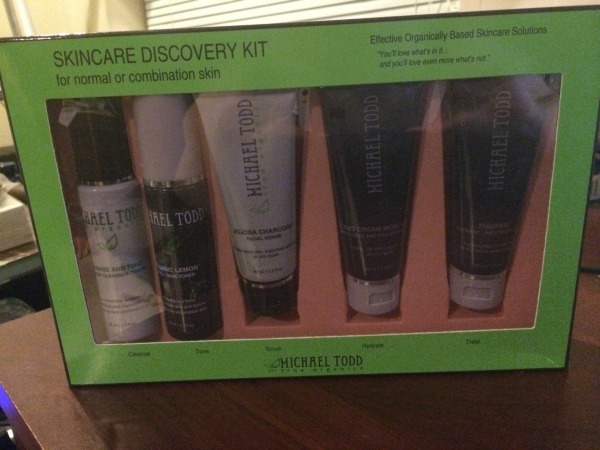 Recently, however, I learned about a new brand of organic products that sounded out of this world, at least to me – the Micheal Todd Skincare Discover Kit for combination skin! After reading a bit about this kit on the TruOrganics website, I couldn’t wait to try it out myself! TruOrganics Michael Todd Skincare Discovery Kit: What is It? Looking for organic skin care products that help get rid of acne while also helping you skin looking amazing? If so, we think you will love TruOrganic‘s Michael Todd Skincare Discovery Kit! This kit gives you everything you need for clearing up acne without using harsh chemicals that damage in the skin. Best of all, all the ingredients in this kit are all natural, giving you a skin care regimen made with amazing ingredients, to give you the full spa experience at home. This kit allows you to try a variety of products in your own home, without spending a small fortune to see what works best for you! One of the first things I loved about this set of products was the scent. Usually acne products smell…well..terrible. I would avoid using some of them because they would turn my stomach or smelled so strong that even Reya wouldn’t come near me after using them. With these products, I look forward to doing my nightly face regimen, and Reya loves checking out my face since it smells so great afterwards. Best of all, this set has my skin feeling absolutely amazing. While its been too soon to tell if it has helped my acne long term, so far I do like the results and can’t wait to see what this kit does in the long run! Would you like to try this kit for yourself? You can buy the Michael Todd Skincare Discovery Kit on the TruOrganic.com for only $46! This TruOrganics Michael Todd Skincare Discovery Kit would be super for my family to try. The price is terrific for what you get and it seems like an effective product. This sounds wonderful and you are right, most of the skincare products are smelly. Thank you for your review. This would make a great affordable gift for someone you want to pamper – or even pamper yourself! I wish I had known about Tru Organics Michael Todd Skincare Discovery back when I suffered from acne. It sounds like a very good product. Skincare is so important. I had dermatologist before but it’s too expensive now. Organic is the way to go.